The City of Minneapolis is getting serious about implementing a Time of Sale Energy Disclosure, which would add information about energy efficiency to Truth-In-Sale of Housing (TISH) evaluation reports. The goal is for this information to be collected at the same time as the TISH evaluation, ideally by the same TISH evaluator. Create time-of-sale and time-of-rent energy label disclosure. New homeowners and potential tenants are a target group to promote energy upgrades, as they can be more receptive to making these investments (particularly when financing is available). Tenants could also use an asset rating label to make comparisons about energy performance and cost between units or buildings. Minneapolis currently requires a home inspection prior to any Minneapolis home being put on the market (the Truth-in-Housing program). The City could green the Truth-in-Housing program by including the collection of data sufficient to generate an energy label as well as other easily accessible data such as lead paint, history of superfund site, etc. In order to be cost-effective, data collection would need to be as limited as possible while providing useful information to the homeowner. 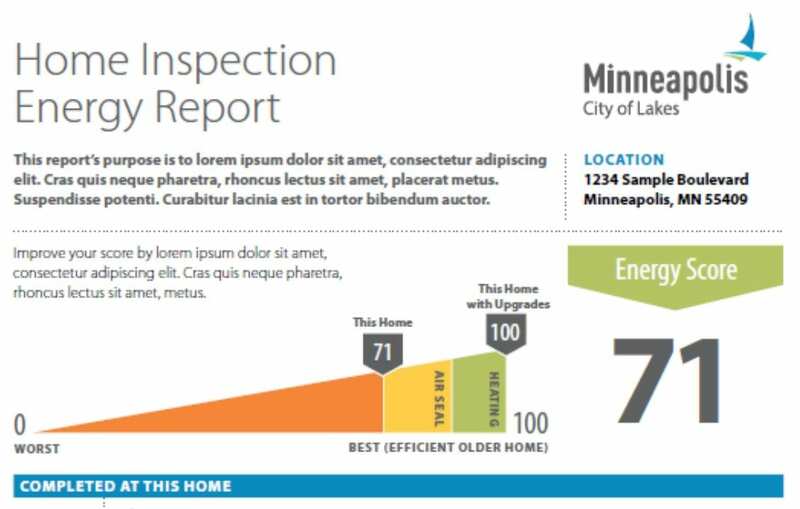 The Center for Energy and Environment has developed an energy label that is particularly relevant for Minneapolis housing stock that is currently being used in the Community Energy Services residential program, and could be expanded for use in the Truth-in-Housing program. A label for multi-family structures does not yet exist. So that’s what’s driving this whole thing. Minneapolis is committed to implementing a program that discloses information about energy use in buildings at the time that the building is offered for sale. The analogy I’ve heard is that we don’t buy vehicles without MPG ratings, but we’re perfectly accustomed to buying homes without energy ratings. The logical counterpoint to this argument, however, is that we’re perfectly accustomed to buying used vehicles without MPG ratings. In 2016, I met with a representative from the Center for Energy and Environment (CEE) to hear more about this proposed program, and I expressed interest in being involved in the test program. CEE began rolling out the test program in 2017, starting with some meetings to explain the program. We attended an information meeting on the program in 2017 and decided that we were not willing to participate in the pilot program. The pilot program required blower door testing and a bunch of data collection for $75 per home, which was not feasible for us. My company backed out of the program at that point, and I’ve heard little about it since. 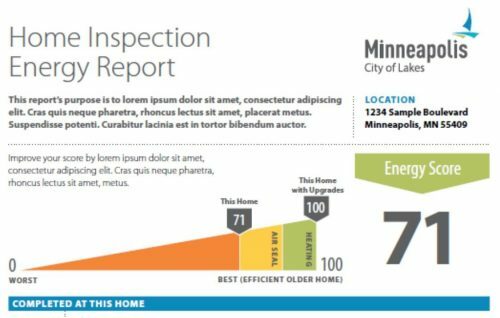 In September of 2018, CEE published a document explaining how and why this whole program could work, titled TRANSFORMING THE MARKET FOR ENERGY EFFICIENCY IN MINNEAPOLIS: Recommendations for Residential Energy Efficiency Rating and Disclosure. A public meeting was held on January 7th to discuss the details of these plans. Three energy disclosure policies were presented at this meeting; rental, multi-family, and time of sale / Truth in Housing. The only one to have any discussion was the part about Truth in Housing. TISH evaluators aren’t insured to drill holes in walls. What happens when asbestos falls out of the wall? How is dust containment supposed to happen? What happens when a knob & tube wire in a wall is drilled through? What happens when homeowners are upset about having a hole drilled in their wall? That’s for starters. Even if we could get past a dozen more objections like this, is there really value in drilling through the wall? I seriously question the benefit of drilling a hole in the wall. What if you just happened to drill the one area where insulation was added? Or vice versa? Sounds sweet, right? The problem is that the proposed program requires the TISH evaluator to perform blower door testing at every home, which is a time-consuming process. This will jack up fees on TISH evaluations…big time. Add on the cost for the needed blower door equipment, and the fees for TISH evaluations will at least double. I say this as a licensed TISH evaluator, and I think I’m being conservative. Energy disclosure is a good thing, reduced energy consumption is a good thing, and improved energy efficiency for homes is a good thing. Here at Structure Tech, we spend a lot of time talking about energy usage during our home inspections. We’re passionate about this stuff, and we support the City’s Climate Action Plan. I’m concerned, however, that the proposed methods would force home sellers through an undue hardship when selling their home. If we’re going to be drilling big holes in walls and performing blower door testing, the disclosure requirement will significantly increase the cost of TISH evaluations. A Time-of-Sale energy disclosure program is going to happen, but exactly how it happens has yet to be determined. What do you think of this program? What could make it better? Minneapolis will be having another public meeting coming up in February. I’ll post the details here once I have them. This energy disclosure is welcoming when the state is going through energy crisis. Being a responsible citizen, we must cooperate and promote energy upgrades. Homeowners often lack understanding about how their homes work and important maintenance tasks they should be undertaking. This is doubly true when it comes to the efficiency of their homes. Knowing the status of their asset’s (home’s) efficiency and how it can be improved is extremely valuable information. Blower door tests take time. Drilling a wall inspection hole to verify insulation type and depth is not terribly convenient. My question is, is there any other alternative the can provide anywhere near the same clarity of information to a homeowner or buyer? You cannot with certainty quantify how leaky a home is without a blower door test. To check on insulation in the wall you could use an IR camera, but this will only tell you if there is some insulation contact on the interior wall only if there is a good enough temperature difference between the inside and outside. Spring, fall and cool/rainy/cloudy summer days you cannot get a good image. Even in the middle of winter you might get a misleading reading. For example, an IR image might show the wall cavities are warmer than the studs indicating there is insulation material that has an R value greater than the wood stud. In a 2×4 framed house that stud has an R value of maybe R4, with partial wall insulation the stud could show up cooler giving you a false positive of good insulation coverage, while in reality there is plenty of space to dense pack the walls greatly improving the comfort and efficiency of the home. Drilling and a hole and checking the cavity is the only certifiable way to be sure. You can use an IR camera to help know where a good spot to drill might be or to check that the area drilled is consistent with the rest of the house, but not as the main test method. I do energy audits and drilling a wall inspection hole is not my favorite task. I’ve tried to think of another way to confidently let the homeowner know the status of their wall insulation and haven’t thought of a better way. I’d be interested to see what other ideas people have, but until then I don’t see any other better tests than drilling an inspection hole and preforming a blower door test. Thanks for the info re: IR usefulness. I have been wondering why that idea didn’t take off (the previous best idea for figuring out insulation values). I would imagine one of the problems with drilling holes in walls would be figuring out where and how indicative it is of the real conditions behind the wall. Otherwise, you’d have to drill a bunch of holes and avg your results. My prev. house (1906 vintage) was energy audited and the guy went to my upstairs bedroom and drilled a hole in the back wall of the closet (exterior, near the roofline). It didn’t tell either of us anything really useful because it was only 1 hole. OTOH, it was one hole in a place that didn’t matter visually or functionally. He filled it with expansion foam which I later trimmed and repaired as with any other hole in plaster. I found the blower door info and technique somewhat more useful, but still it didn’t tell me anything about where the air leaks were, only that there were some. So I guess the short answer is: there is no short, easy way to answer the question of how well insulated vs drafty any house is. The nearest big city to me, Portland, Oregon, enacted something like this a couple years ago. It’s called an Energy Score Rating and sellers are required to do it before listing their house for sale. There is no hole drilling required so it sounds a bit different. I can see why people are objecting to that. Anyway, as an owner of an inspection company I took all the training to offer the service but never completed it. All of the companies performing energy upgrades are offering the inspection for super cheap as a lost leader of sorts. Some photographers and house stagers have banded together to offer a “listing package” of sorts. In the end it really has no impact on my inspection company and has really just turned out to be a minor annoyance to agents and sellers. From what I hear talking to buyers, they hardly are aware of energy efficiency and don’t use it as a buying criteria at all. All this will do is force people to sell houses as is forcing prices down because they are as is. So they find it doesn’t have enough insulation? What happens? Who is going to pay for the upgrade. As a seller I am not going to. You want a better idea force people to list their electric and gas use for the last 12 months prior to listing the house. Buyers will be savvy enough to figure out the information they need. I have bought more than 6 houses ranging from a mini Victorian built in 1908 to brand new construction. I also work in the construction industry so I am pretty knowledgeable about housing. These people are out of control. Everybody connected to collect a fee treat you like a large endless cookie jar (your pot of money) and there is no end to this test or that test. Having septic soil boring done in frozen ground in March as an example. I give them the test results from septic drain field report approved when installed 12 years ago, but NO, the sandy soil must have shifted and we need a new inspection and cost to be able to sell our house. Same with well – water tests are way below readings and you pay for that test, only to have 6 days before closing saying you have to hook up to city water when Brooklyn Park says you don’t have to with a clean, functional well. It it any wonder housing prices are unaffordable with all these extras. As someone in the sustainable living profession, I applaud Mnpls for putting together a concrete action toward their 15% goal. Should have been done years ago, but now is a good 2nd best time to get started. As a 2nd time old-home owner and advisor to others w/ old homes, I have often discussed the value of knowing energy use vs energy efficiency in order to include that info in any upgrade/remodeling plans. So I think getting this info to homeowners is good — I think it needs to go to new home owners, townhome and condo owners as well even though the common image is that this is something of interest mostly to old-home owners. I am on the fence re: Truth-in-Housing being the appropriate avenue to get this info into homeowners’ brains. Granted, this is one of the very few ways a city can leverage/motivate its home-owners. Like you, I am concerned about the added demands to an already long inspection list and also added equipment and training that will be required of inspectors. If my job required me to write a similar rule today, I think I would also write it into pre-sale inspections or maybe to the real estate agents side of the process and then get CEE and friends to push it with marketing and information campaigns so sellers and or buyers create and push the demand for the info. I am afraid that would only be a little step up from status quo until market demands get so strong the practice becomes common. I would also put the existing energy auditors in front, not add more work for you building inspectors unless you want to branch out into that niche. Probably too late for my idea, but as usual, the city acts then informs us of its decision — not entirely thinking through the consequences , making more work not in balance with reward for those doing the work, and further frustrating already overwhelmed & under funded buyers. The people most affected will be the buyers least able to afford another fee or fee increase. I am also concerned that there is weak structure for what a seller or buyer is expected to do with this info once the efficiency testing/inspection has been done. The City Council members should be apart of a pilot program. Meaning their homes should have holes drilled in and blower door test. Once they see what’s involved it will change their mindset. I believe a blower door test can accomplish this without the holes. I also think there should be specification related to the age of the home. I hate that somebody making 98,000 a year telling me what to do with my house–especially when I need new windows and my attic is fine.